SO much for peace and Love. People are shoving each other out of the way to get into the dark room at the back of Cream. You shoot a mini-dressed girl a look for barging an elbow into you and she just looks back like you’re some kind of idiot. “What’s your problem?” say her eyes. “Don’t you realise? Oakey’s on in a minute.” So you jostle for your own little space as the lights go down and the entire crowd turns to the darkened DJ booth and erupts into slow, measured clapping. The chant goes up: “GO OAKEY! GO OAKEY! GO OAKEY!” and the man just stands there, grinning broadly for a couple of minutes. Letting the silence build until it’s plain uncomfortable. Making us wait. Then, easing up the fader on BT’s “Flaming June”, a soft tide of sound washes out. The people rushing into the room erupt like Robbie Fowler’s just put away a belter against Man U. We’re off. 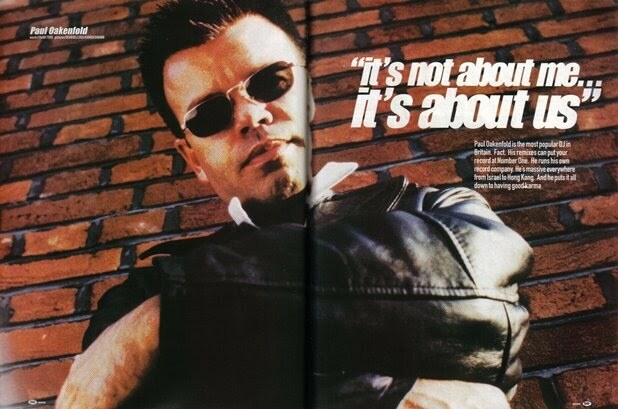 PAUL Oakenfold was the first acid house DJ I ever heard. It was in the summer of 1988 (when else?) at the Zap Club in Brighton. For me, it was a dive into unfamiliar sensory territory, the sickly sweet smell of the smoke, the Lucozade everyone was inexplicably drinking, the insane ritual arm waving and chanting. And at the core of it all was the music. Paul Oakenfold, a man sporting the longest hair and baggiest T-shirt I’d ever seen, was dancing away behind the decks, mixing weirdly European-sounding records like “Jibaro” and Mory Kante’s “Yeke Yeke” in with the twittering Chicago 303s. Raze’s “Break For Love” lifting out of the speakers at the end of the night. Although back then I didn’t know the name of the tune, I just thought it was the most outlandish, ethereal record I’d ever heard played in a club. Even in my pre-E innocence, the fact clubbing could be such an all-encompassing, communal experience was an truly overwhelming revelation. I went up to the decks and shook Paul Oakenfold’s hand. He grinned warmly and thanked me. “That was nothing, really” said Paul as we drove back to his hotel. “A couple of weeks ago they were cheering like that for 25 minutes.” It’s been a busy 10 years for Oakey. A whole decade of dance which has seen him moving from E’d up early Balearic evangelist, to defining indie dance with the Happy Mondays, to going across the world as tour DJ for U2 and launching his own Perfecto Label. A year ago, Oakenfold took over a residency in the Annexe at Cream. It’s a dark, low-ceilinged room which has traditionally provided a home for the harder techno DJs. When it kicks, the sweat gathers as condensation on the ceiling then falls onto the crowd in huge salty raindrops. It’s a black hole of a squat party dropped right in the middle of one of the biggest, glammest clubs in the land. “Last year, I sensed the change in the club scene,” Paul tells me later, “Everyone seemed to be about take, about milking the scene for everything they could. I thought it was about time I gave something back.” He did it by accepting a residency in the Annexe. If it was Saturday and you wanted to hear Paul Oakenfold, you had no choice. You had to come to Cream. And in return, from midnight till three every Sunday morning, Paul has turned the room into his own little trance den. Into the most exciting corner of any club in Britain. Today, the Annexe still has the same grimy, dark dirty charm. But it’s livened up by a polystyrene menagerie of glowing toy animals hanging over the clubbers’ heads. There are psychedelic projections beamed onto screens in the corners. Cream’s grubby little squat has gone fluoro. It’s all gone totally. . . Oakenfold. Monday Lunchtime, in a pasta restaurant round the corner from Paul’s label, Perfecto on Kensington High Street, west London. 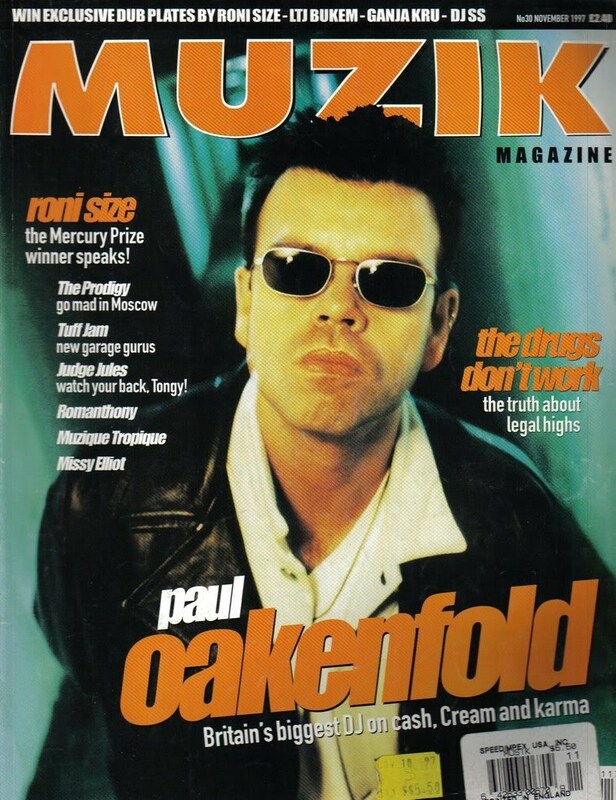 Oakenfold’s looking tanned and healthy after six weeks in Ibiza, playing weekly six-hour sets at Cream’s Amnesia residency. Then flying back to Liverpool every Saturday, of course. THE CROWD SEEM TO RESPECT THAT? “Yeah. There’s a strong crowd of people who come every week. 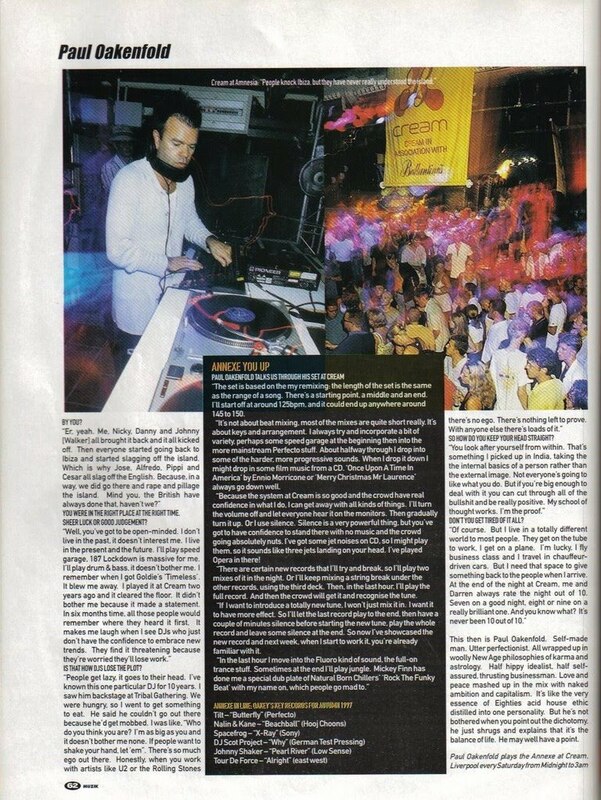 Last time I played at the Ministry Of Sound, the number of people who came down from Liverpool was unbelievable. I could have been resident in clubs a lot nearer to where I live, but if the crowd can make that kind of commitment, then so can I. It’s not about me. It’s about us. WHAT DO YOU THINK MAKES A GOOD DJ? WHAT’S SO SPECIAL ABOUT CREAM? IS THIS YOUR ACID HOUSE ROOTS SHOWING THROUGH? “People knock Ibiza, but they’ve never really understood the island. I thought I’d go out for six weeks, really enjoy the island. If you go for two weeks, you don’t really get to know a place. For the last three years, the north side of the island have been holding open air parties that the English just don’t know about. There’s nothing better than going to a party on a beautiful beach with people from all around Europe dancing as the sun comes up. It has to be secret because the clubs don’t like it and would report it to the police. It’s an older crowd who don’t go to the clubs anymore, but still come to Ibiza because the spirit of the island is so strong. I wanted to put across some of that vibe at Amnesia. YOU WERE IN THE RIGHT PLACE AT THE RIGHT TIME. SHEER LUCK OR GOOD JUDGEMENT? IS THAT HOW DJS LOSE THE PLOT? SO HOW DO YOU KEEP YOUR HEAD STRAIGHT? DON’T YOU GET TIRED OF IT ALL? This then is Paul Oakenfold. Self-made man. Utter perfectionist. All wrapped up in woolly New Age philosophies of karma and astrology. Half hippy idealist, half self-assured, thrusting businessman. Love and peace mashed up in the mix with naked ambition and capitalism. 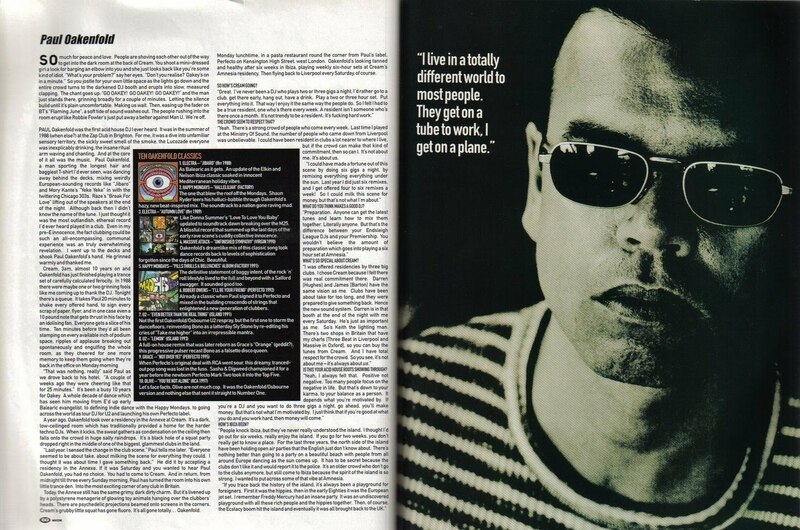 It’s like the very essence of Eighties acid house ethic distilled into one personality. But he’s not bothered when you point out the dichotomy, he just shrugs and explains that it’s the balance of life. He may well have a point. As Balearic as it gets. An update of the Elkin and Nelson Ibiza classic soaked in innocent Mediterranean holiday vibes. The one that blew the roof of the Mondays. Shaun Ryder leers his halluci-babble through Oakenlold’s hazy, new beat-inspired mix. The soundtrack to a nation gone raving mad. Like Donna Summer’s “Love To Love You Baby” updated to soundtrack dawn breaking over the M25. A blissful record that summed up the last days of the early rave scene’s cuddly collective innocence. Oakenfold’s dreamlike mix of this classic song took dance records back to levels of sophistication forgotten since the days of Chic. Beautiful. The definitive statement of baggy intent, of the rock ‘n’ roll lifestyle lived to the full and beyond with a Salford swagger. It sounded good too. Already a classic when Paul signed it to Perfecto and mixed in the building crescendo of strings that enlightened a new generation of clubbers. Not the first Oakenfold/Osbourne U2 respray, but the first one to storm the dancefloors, reinventing Bono as a Latterday Sly Stone by re-editing his cries of “Take me higher” into an irrepressible mantra. A full-on house remix that was later reborn as Grace’s “Orange” (geddit? ), this progressive pulser recast Bono as a falsetto disco queen. When Perfecto’s original deal with RCA went sour, this dreamy tranced-out pop song was lost in the fuss. Sasha & Digweed championed it for a year before the newborn Perfecto Mark Two took it into the Top Five. Let’s face facts. Olive are not much cop. It was the Oakenfold/Osbourne version and nothing else that sent it straight to Number One. 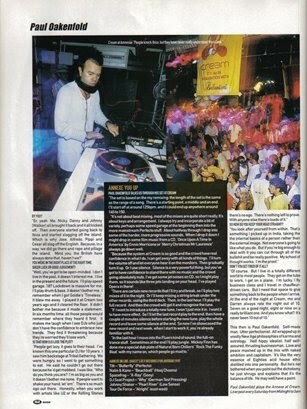 “The set is based on the my remixing: the length of the set is the same as the range of a song. There’s a starting point, a middle and an end. It’ll start off at around 125bpm, and it could end up anywhere around 145 to 150. “It’s not about beat mixing, most of the mixes are quite short really. It’s about keys and arrangement. I always try and incorporate a bit of variety, perhaps some speed garage at the beginning then into the more mainstream Perfecto stuff. About halfway through I drop into some of the harder, more progressive sounds. When I drop it down l might drop in some film music from a CD. ‘Once Upon A Time In America’ by Ennio Morricone or ‘Merry Christmas Mr Laurence’ always go down well. “Because the system at Cream is so good and the crowd have real confidence in what I do, I can get away with all kinds of things. I’ll turn the volume off and let everyone hear it on the monitors. Then gradually turn it up. Or I use silence. Silence is a very powerful thing, but you’ve got to have confidence to stand there with no music and the crowd going absolutely nuts. I’ve got some jet noises on CD, so I might play them, so it sounds like three jets landing on your head. I’ve played Opera in there! “There are certain new records that I’ll try and break, so I’ll play two mixes of it in the night. Or I’ll keep mixing a string break under the other records, using the third deck. Then, in the last hour, I’ll play the full record. And then the crowd will get it and recognize the tune. “If I want to introduce a totally new tune, I won’t just mix it in, I want it to have more effect. So I’ll let the last record play to the end, then have a couple of minutes silence before starting the new tune, play the whole record and leave some silence at the end. So now I’ve showcased the new record and next week, when I start to work it, you’re already familiar with it.